One of the first chemicals to be produced in large amounts through industrial process, was sulphuric acid. In 1736, the pharmacist Joshua Ward developed a process for its production that involved heating saltpeter and allowing the sulfur to oxidize and combine with water. It was the first practical production of sulfuric acid on a large scale. John Roebuck and Samuel Garbett were the first to establish a large scale factory in Prestonpans in 1749, which used leaden condensing chambers for the manufacture of sulphuric acid. 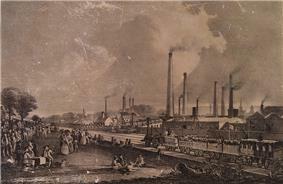 Charles Tennant's St.Rollox Chemical Works in 1831, then the biggest chemical enterprise in the world. In the early 18th century, cloth was bleached by treating it with stale urine or sour milk and exposing it to sunlight for long periods of time, which created a severe bottleneck in production. Sulphuric acid began to be used as a more efficient agent as well as lime by the middle of the century, but it was the discovery of bleaching powder by Charles Tennant that spurred the creation of the first great chemical industrial enterprise. His powder was made by reacting chlorine with dry slaked lime and proved to be a cheap and successful product. He opened a factory in St Rollox, north of Glasgow and production went from just 52 tons in 1799 to almost 10,000 tons just five years later. Soda ash was used since ancient times in the production of glass, textile, soap, and paper and the source of the potash had traditionally been wood ashes in Western Europe. By the 18th century, this source was becoming uneconomical due to deforestation and the French Academy of Sciences offered a prize of 2400 livres for a method to produce alkali from sea salt (sodium chloride). 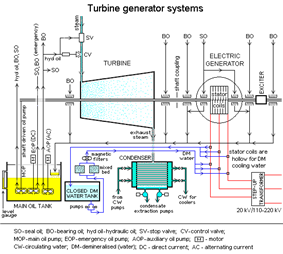 The Leblanc process was patented in 1791 by Nicolas Leblanc who then built a Leblanc plant at Saint-Denis. He was denied his prize money because of the French Revolution. 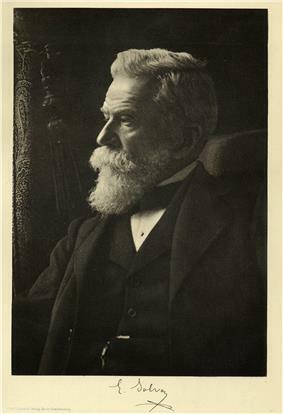 Production of artificial manufactured fertilizer for agriculture was pioneered by Sir John Lawes at his purpose built Rothamsted Research facility. In the 1840s he established large works near London for the manufacture of superphosphate of lime. Processes for the vulcanization of rubber were patented by Charles Goodyear in the US and Thomas Hancock in England in the 1840s. The first synthetic dye was discovered by William Henry Perkin in London. He partly transformed aniline into a crude mixture which, when extracted with alcohol, produced a substance with an intense purple colour. He also developed the first synthetic perfumes. However, it was German industry that quickly began to dominate the field of synthetic dyes. The three major firms BASF, Bayer and Hoechst produced several hundred different dyes, and by 1913, the German industry produced almost 90 percent of the world supply of dyestuffs and sold about 80 percent of their production abroad. Basic chemicals, or "commodity chemicals" are a broad chemical category including polymers, bulk petrochemicals and intermediates, other derivatives and basic industrials, fertilizers. Typical growth rates for basic chemicals are about 0.5 to 0.7 times GDP. Product prices are generally less than fifty cents per pound. Chemicals in the bulk specialty chemicals category (see below). salt, chlorine, caustic soda, soda ash, acids (such as nitric acid, phosphoric acid, and sulfuric acid), titanium dioxide, and hydrogen peroxide. Speciality chemicals are sold as effect or performance chemicals sometimes they are mixtures of formulations unlike "fine chemicals" which are almost always single molecule products. Consumers rarely if ever come into contact with basic chemicals but polymers and speciality chemicals are the materials that they will encounter everywhere in their every-day lives, such as in plastics, cleaning materials, cosmetics, paints & coatings, electronic gadgets, automobiles and the materials used to construct their homes. These speciality products are marketed by chemical companies to the downstream manufacturing industries as pesticides, speciality polymers, electronic chemicals, surfactants, construction chemicals, Industrial Cleaners, flavours and fragrances, speciality coatings, printing inks, water soluble polymers, food additives, paper chemicals, oil field chemicals, plastic adhesives, adhesives and sealants, cosmetic chemicals, water management chemicals, catalysts, textile chemicals. Chemical companies rarely supply these products directly to the consumer. Every year, the sulfuric acid (44 million tons), nitrogen (34), ethylene (28), oxygen (27), lime (22), ammonia (17), propylene (16), polyethylene (15), chlorine (13), phosphoric acid (13) and diammonium phosphates (12). The largest corporate producers worldwide, each with plants in numerous countries, include BASF, Bayer, Braskem, Celanese/Ticona, Arkema, Dow, DuPont, Eastman Chemical Company, Evonik Industries, ExxonMobil, Formosa Plastics, Givaudan, INEOS, LANXESS, LG Chem, LyondellBasell, Mitsubishi, Monsanto, PPG Industries, SABIC, Shell, Shin-Etsu, Sinopec, Solvay, Sumitomo Chemical and Wanhua along with thousands of smaller firms. in 2012 The chemical sector accounted for 12% of the EU manufacturing industry's added value. Europe remains world’s biggest chemical trading region with 43% of the world’s exports and 37%of the world’s imports, although the latest data shows that Asia is catching up with 34% of the exports and 37% of imports. Even so Europe still has a trading surplus with all regions of the world except Japan and China where in 2011 there was a chemical trade balance. Europe’s trade surplus with the rest of the world today amounts to 41.7 billion Euros. The chemical industry has shown rapid growth for more than fifty years. The fastest-growing areas have involved the manufacture of synthetic plastics, fibres and elastomers. Historically and presently the chemical industry has been concentrated in three areas of the world, Western Europe, North America and Japan (the Triad). The European Community remains the largest producer area followed by the USA and Japan. The industry includes manufacturers of organic-industrial chemicals, ceramic products, petrochemicals, agrochemicals, polymers and rubber (elastomers), oleochemicals (oils, fats, and waxes), explosives, fragrances and flavors. Examples of these products are shown in the Table below. 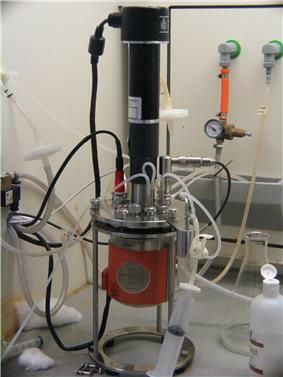 This novel chemical reactor reduces the amount of solvent used from 1000 litres to just 4 litres. The processes and product or products are usually tested during and after manufacture by dedicated instruments and on-site quality control laboratories to ensure safe operation and to assure that the product will meet required specifications. The products are packaged and delivered by many methods, including pipelines, tank-cars, and tank-trucks (for both solids and liquids), cylinders, drums, bottles, and boxes. Chemical companies often have a research-and-development laboratory for developing and testing products and processes. These facilities may include pilot plants, and such research facilities may be located at a site separate from the production plant(s). The scale of chemical manufacturing tends to decline from largest=Petrochemicals and commodity chemicals, then specialty chemicals and smallest=fine chemicals. 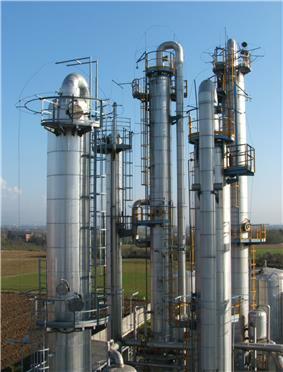 The commodity and petrochemical manufacturing units are on the whole single product continuous processing plants. Specialty Chemical and Fine Chemical manufacturing are mostly made in discrete batch processes. Those chemicals made on the largest of scales are made in a few manufacturing locations around the world, for example in Louisiana in the USA, on Teesside in the Northeast of England in the UK and in Rotterdam in the Netherlands. 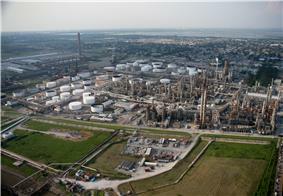 Not all of the petrochemical or commodity chemical materials that are produced by the chemical industry are made in one single location but groups of related materials often are to induce industrial symbiosis as well as material, energy and utility efficiency and other economies of scale. Speciality and Fine Chemical Companies are often found in similar locations but in many cases they are to be found in multi sector business parks. The large scale manufacturing locations often have clusters of manufacturing units that share utilities and large scale infrastructure such as power stations, port facilities, road and rail terminals. In the United Kingdom for example there are 4 main locations for commodity chemical manufacture: near the River Mersey in Northwest England, on the Humber on the East coast of Yorkshire, in Grangemouth near the Firth of Forth in Scotland and on Teesside as part of the Northeast of England Process Industry Cluster (NEPIC). To demonstrate the clustering and integration, mentioned above, some 50% of the UK's petrochemical and commodity chemicals, are produced by the NEPIC industry cluster companies on Teesside. The chemical industry includes large, medium, and small companies located worldwide. Companies with sales of chemical products greater than $10 billion in fiscal year 2007 appear listed below. For some of these companies the chemical sales might represent only a portion of their total sales; (for example ExxonMobil's chemical sales covered only 8.7 percent of their total sales in 2005). ^ Aftalion, Fred (1991). A History of the International Chemical Industry. Philadelphia: University of Pennsylvania Press. pp. 11–13. ^ a b A History of the International Chemical Industry. ^ "PTFE Properties". http://www.fluorotherm.com/. Fluorotherm Polymers, Inc. Retrieved 31 October 2014. ^ ﻿Global Specialty Chemicals﻿ (Report). =Marketline. May 2012. http://2012e.igem.org/articles/eng/images/f/fb/Global_Specialty_Chemicals_Profile.pdf. Retrieved 16 September 2012. ^ ﻿Global Speciality Chemicals﻿ (Report). MarketLine. May 2012. http://2012e.igem.org/articles/images/f/fb/Global_Specialty_Chemicals_Profile.pdf. ^ "GLOBAL TOP 50 Chemical Companies (2012)". ^ "Facts and Figures 2012:The European chemicals industry in a worldwide perspective". CEFIC. Retrieved 5 August 2013. ^ Higgins, Stan (April 2013). "European Chemicals Industry:A review". Chemical News. pp. 18–20. ^ "Facts and Figures 2012:The European chemicals industry in a worldwide perspective". CEFIC. p. 6. Retrieved 5 August 2013. ^ "Facts and Figures 2012:The European chemicals industry in a worldwide perspective". CEFIC. p. 7. Retrieved 5 August 2013. Alfred D. Chandler. Shaping the Industrial Century: The Remarkable Story of the Evolution of the Modern Chemical and Pharmaceutical Industries. Harvard University Press, 2005. 366 pp. ISBN 0-674-01720-X. chapters 3-6 deal with DuPont, Dow Chemicals, Monsanto, American Cyanamid, Union Carbide, and Allied in USA; and European chemical producers, Bayer, Farben, and ICI.